Yola, as I discover her name, welcomed us warmly. She showed us how to operate the doors, reminded us that someone is available to let us in 24 hours a day, and took our passports briefly to complete her required paperwork. Feeling vulnerable, I asked about how safe the neighborhood was; she said that walking during the day is just fine. After dark, do not carry a purse, she chided. In Houston, I remember standing in Brookstone, evaluating money belts. $19.99 for the basic. Did we really need one? I recall donating many items I had used for travel in the past and had a hard time re-purchasing things unless I knew they were necessary. Honestly regretting this decision now. We started to explore since it was early and popped our heads into a restaurant asking if they had room for dinner around 6 p.m. They looked at us like we were crazy. Ok, we can wait a bit longer. By the way, I chided. We are vegetarians. More blank stares. Feeling underdressed, we retreated to our room. I put on a lace trimmed rent the runway dress, pulled my hair up into a few pins, and encouraged Justin to join me before we became sleepy after the travel. I cautiously put several valuable items in the room safe but felt vulnerable with some jewelry items. Sliding on a few mock pieces on my fingers, I found a necklace chain and wrapped the most valuable pieces around a chain and affixed them to the side of my underwear. Kicking myself for not purchasing the money belt, I subsided any anxiety knowing that all items would be on me. Only a few blocks away was a restaurant with the highest of reviews. La Guarita. We climbed the marble staircase through the building under renovation which reflected centuries of history, to inquire about space for two. Christmas Eve without a reservation. 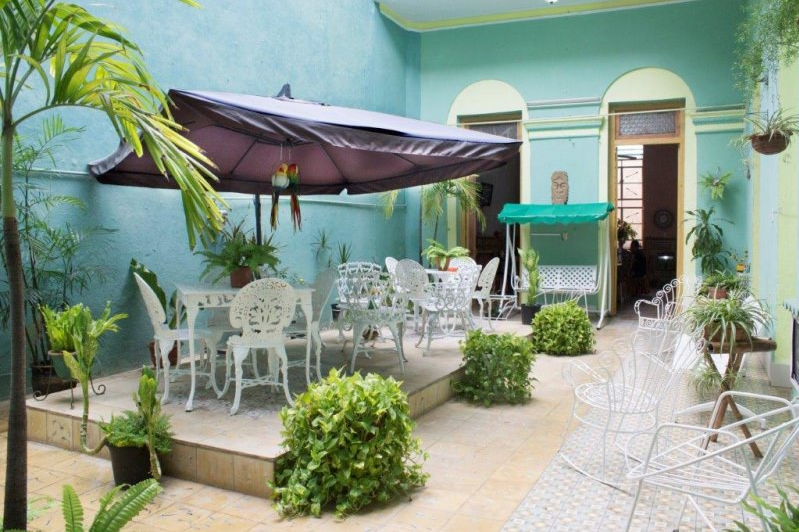 The hostess summoned her supervisor and moments later we were seated atop the building viewing the lights of Havana. The next party was scheduled to arrive at 9:15. We had an hour to indulge.